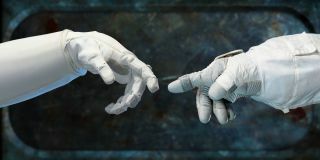 The International Space Station's humanoid robot helper, Robonaut 2, reaches out to touch a gloved astronaut hand in a photo that pays tribute to Michelangelo's Sistine ceiling painting. Humans and robots appear to be coming closer than ever in a NASA photo that features the International Space Station's Robonaut-2 paying tribute to a famous Michelangelo painting. NASA engineers recently set up the photo to show the humanoid-shaped Robonaut 2 reaching out to touch an astronaut's gloved finger. The picture calls to mind the famous panel from the Vatican's Sistine Chapel that shows the hand of God reaching out to give life to Adam. In the NASA photo, called "Man and Machine," the astronaut plays the role of God, while Robonaut's hand appears in place of Adam's. It's a fitting allusion to the robot as a child of humans. Michelangelo painted his famous ceiling masterpiece between 1508 and 1512. The work, which was commissioned by Pope Julius II, covers a huge Papal chapel inside Vatican City in Rome. The famous Creation of Adam panel is part of a series from the Bible's Book of Genesis in the ceiling's fresco painting. Robonaut-2 is a dexterous machine built by NASA and General Motors to help out astronauts working on the International Space Station. The $2.5 million space bot was launched on the space shuttle Discovery in February 2011, and has been running through checkouts and tests ever since. In February, Robonaut-2 shook an astronaut's hand for the first time. Earlier this month, the robot passed a big milestone when it used a tool for the first time to complete a job that used to require station astronauts. On March 14, Robonaut-2 successfully used a gauge to measure air flow in front of various vents on the outpost — a task that must be done every 90 days or so. "Robonaut is healthy and has been performing very well," Joyce said. Next month, Robonaut-2 is scheduled to perform its first jobs involving flipping switches and buttons on a taskboard. The robot's human team of operators and engineers on the ground were so proud of their creation that they decided to showcase it in the photo-op, which shows just how special Robonaut-2 is. It's hard to distinguish its gracefully curling hand from the astronaut's glove in the picture. "I don’t believe we'll ever achieve a future where robots can do everything a human can do," Joyce said. "It will certainly never able to replace human ingenuity and drive in capability. Our goal is really to help the crewmembers complete their tasks."